Even a fine blog, alas, can become moribund after a few years, or at least distressingly sparse in its postings. It’s little wonder that even the best blogs run dry sometimes. The life of a genealogy blogger, after all, can be a constant tug of war between writer’s block and the urge to blog, writing about research and doing research, online life and real life with all its daily demands and distractions." Chery Kinnick is one of those family history bloggers who encapsulate the essence of an excellent blogger. We all know that, but now the rest of the world knows it! 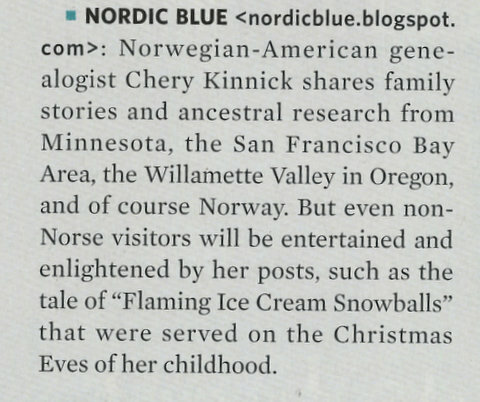 Chery's blog "Nordic Blue' was selected as one of the Top 40 Genealogy Blogs in 2013 by Family Tree Magazine. Family Tree Magazine, "America’s #1 family history magazine, is the leading how-to publication for those who want to discover, preserve and celebrate their roots." The first issue came out in January 2000, and it is now published six times a year with a paid circulation of about 70,000. Good Advice ..... When someone has been there and lived to tell about it (in the form of a blog post), it makes your research a bit easier. Tech Support ..... Thank goodness for these savvy bloggers, who guide you to the best family tree tools for your search. Gravestone Matters ..... These genealogists have a special way of helping us appreciate cemeteries for the genealogical haven. Shop Talk ..... Keeping up with genealogy news and resources can be a job unto itself. Story Time..... The family tales of these bloggers engage us with words and images, and offer useful bits of research wisdom. 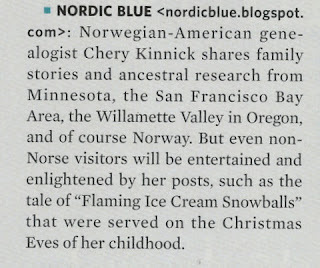 Chery began her blog, NORDIC BLUE, in August of 2006. She was inspired by footnoteMaven* 'during hobnobbing across the table at our Nearby History writing seminar.' Her blog is an inspiration to all of us, regardless of our ethnic heritage. 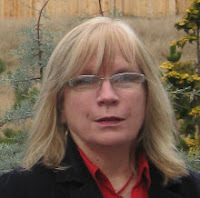 She's an amazing story teller who supports all of her findings, with solid genealogical and historical research using primary and secondary sources. Her tenacity is to be admired. In April of 2008 she published her 100th blog entry! Celebrating 100 Posts & An Announcement. However, she didn't stop there! She has continued blogging and is nearing the milestone of her 200th blog entry, which I'm sure she will accomplish sometime this year (2013). She is also the one who actually started THIS blog! Our first posting in late 2008 was hers, and she's been a regular ever since. Chery is passionate and tenacious in researching, documenting and writing about all things Norwegian-American. It has been my pleasure and honor to associate with this woman, historian, and fellow writer. * FoornoteMaven was recognized by Family Tree Magazine in 2011, as one of the Top 40 Genealogy Blogs in 2011 in the 'Everything Blog' category.